In the history of the music industry, singles very rarely made any money. The cost of production and distribution meant that the unit cost to consumers was way below what it cost the record companies to make them. Although famous for making poor business decisions, this was not because the record companies were stupid. Rather, they knew that singles were the marketing for album sales. A single that did well in the charts would garner a huge amount of coverage and salience at way below the cost of a traditional advertising campaign and would drive album sales, which is where the money was. In the modern world, digital distribution costs come down to almost zero. 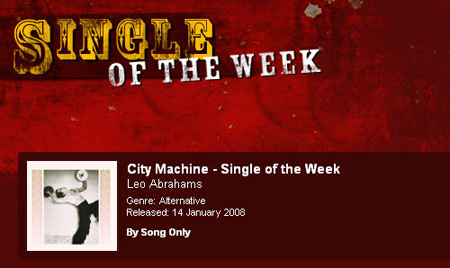 This is why my mate Leo is very pleased indeed that iTunes have picked his single City Machine for single of the week, which means they give it away for free for a week. Leo is a guitar genius and this single features KT Tunstall on vocals. I think it's lovely. But the great thing is that you don't need to take my word for it. Go and download it from the iTunes store - it's free! And if you like it - buy the album.